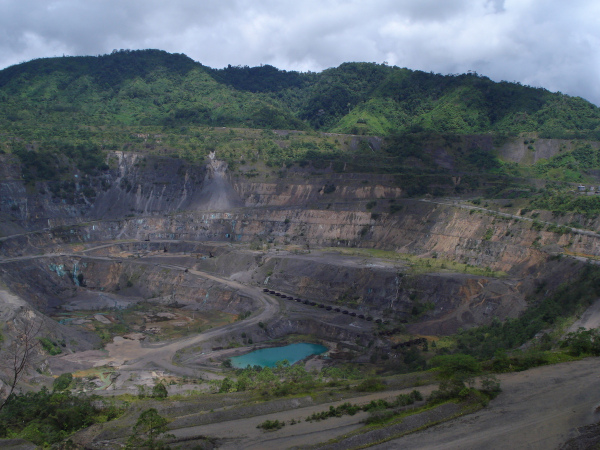 ” The Bougainville Government is holding a crucial mining warden’s hearing at the abandoned copper mine which sparked a decade-long armed insurgency against the Papua New Guinea Government. ” ABG Vice President and Minister for Mining, RAYMOND MASONO is calling on Panguna leaders, PHILIP MIRIORI and LAWRENCE DAVEONA to know that the Panguna mine is no ordinary mine. The Bougainville Government now owns part of Bougainville Copper Limited and wants it to redevelop the mine, but a rival consortium is challenging their bid, and said it has the support of key landowners from Panguna. RTG’s chairman Michael Carrick said the group’s proposal was more realistic and better-supported by the people of Panguna. RTG Mining has told the Bougainville Government that BCL’s exploration licence for Panguna has expired and legally cannot be renewed.”For the first time in 30 years a mining company has been endorsed and supported by the SMLOLA,” Mr Carrick said. He said the landowners would present a 2000-signature petition in opposition to BCL.RTG Mining said the dispute had been settled with their preferred candidate, Philip Miriori, in charge; the Bougainville Government said the mediation had failed and that the matter is still before the courts. Michael Carrick from RTG Mining says the consortium has been dealing openly with the Bougainville Government and that landowner payments are wages for its employees.”The joint venture is a commercial operation and landowners, like anyone else, are able to work and to get paid for their services. Mr Carrick said the intent of the travel ban against Mr Duncan appeared to be to help Bougainville Copper Limited.Bougainville Copper Limited is deeply unhappy with RTG Mining and its partners. Mr Hitchcock said many landowners do support BCL, but are not being properly represented. Bougainville’s Mining Secretary Shadrach Himata said all landowners will be asked for their views as part of the approval process, not just the leaders of the association.”It won’t be affected by the leadership tussle of the SMLOLA landowners.””Right now, the only legal applicant on the exploration tenement is BCL,” he said. The eventual decision on the exploration licence will be made by the Bougainville Executive Council, the regional government’s Cabinet, probably sometime in 2018. Crucially, Mr Himata, said BCL is the only company currently being considered by the Bougainville Government. “The warden’s hearing is a process that will engage the views of all the landowners in the resource areas,” he said. “From what we’ve seen, there is widespread support for mining in Panguna and mining with Bougainville Copper,” he said. “The department didn’t have the resources to manage the application at the time it was taking place,” he said. “We think they’re less than honourable in how they’re carrying on their conduct and their activities in the area,” BCL company secretary Mark Hitchcock said. “It is clear the ABG, on the appointment of the new mining minister, supported BCL and the temporary banning of Renzie, I assume, is designed to limit the support that could be afforded to the landowners of Panguna,” he said. “The wages paid are in respect of services rendered to the joint venture,” he said. The ABG has had the PNG Government ban the key executive from Central Exploration, Sydney lawyer Renzie Duncan, from coming to Papua New Guinea. 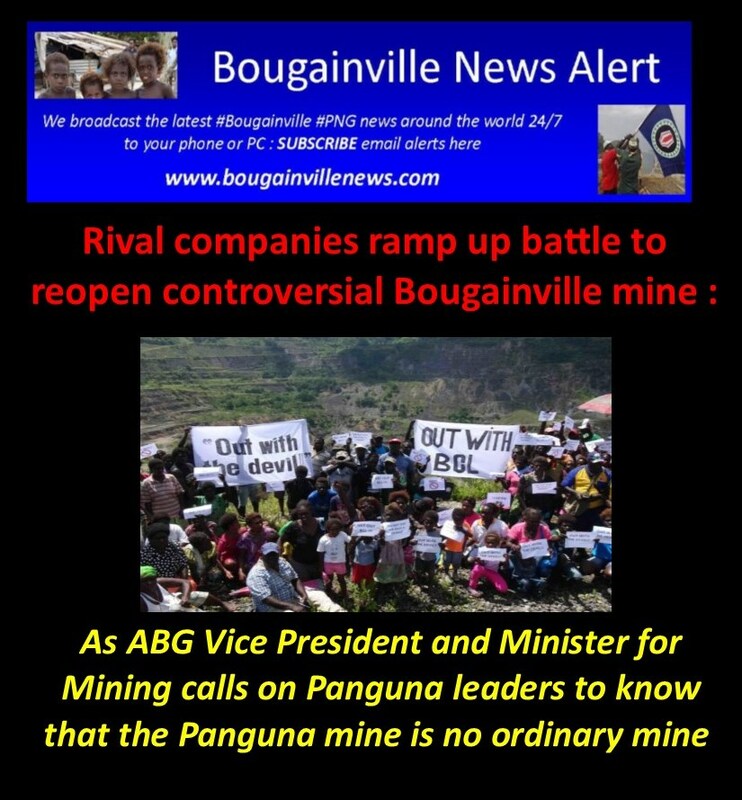 “The Autonomous Bougainville Government (ABG) will not entertain companies who use the back door or break and enter through the window using self-centred individuals who think they have a monopoly over the people’s resources or represent their interests,” Mining Minister Raymond Masono said in a statement. There is a legal dispute over who rightfully chairs the landowner association. RTG Mining said longstanding resentment against BCL over the conflict and the ongoing environmental problems caused by their sudden withdrawal would prevent the company from being able to operate the mine again. It wants the Bougainville Government to consider its application instead, saying the landowner association for the mine pit, the Special Mining Lease Osikaiyang Landowners Association (SMLOLA), backs its bid and would present a 2,000-signature petition in opposition to BCL. “[It’s] a sensible and well-supported and economically deliverable proposal to develop the mine for the benefit of all the people of Bougainville,” he said. That consortium, Central Me’ekamui Exploration Limited, includes ASX-listed RTG Mining. The hearing will help determine if the company Bougainville Copper Limited (BCL), which was forced to abandon the Panguna mine in 1989, should retain an exploration licence for the site.